Follow this simple recipe for an easy to make Crockpot Yoghurt. 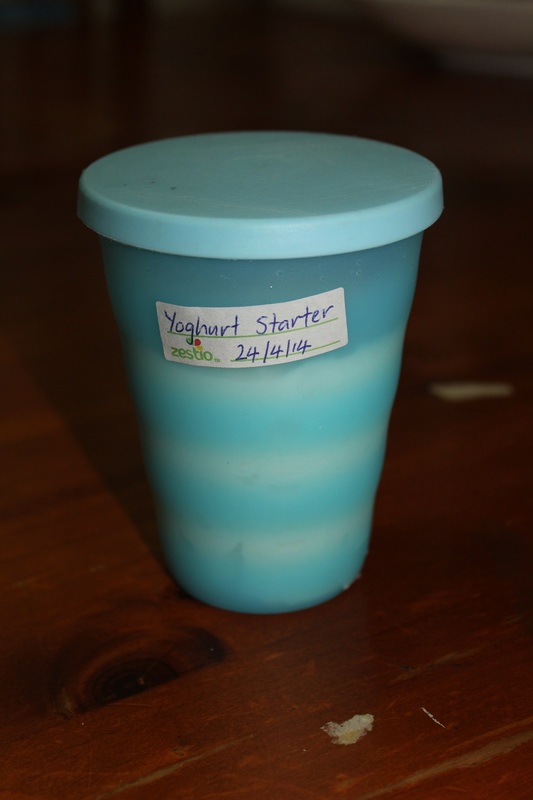 Do you buy store bought yoghurt in 1kg tubs or squeezie packs for your family? Have you thought about making your own? 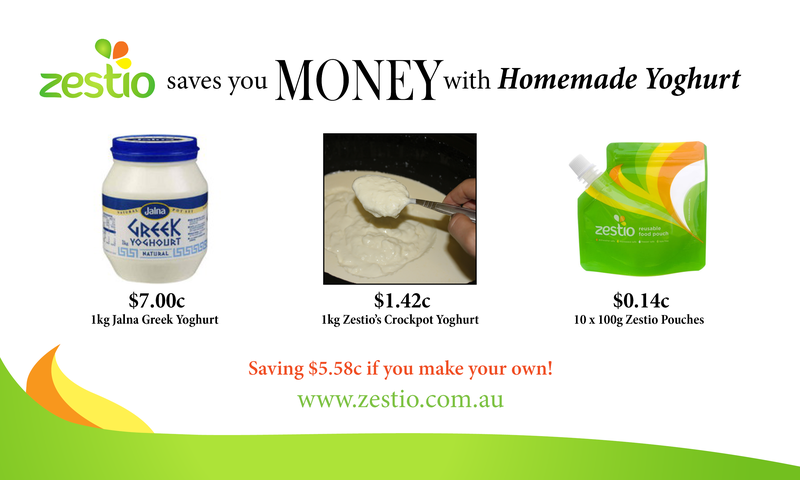 Making homemade yoghurt is fun, very economical (cheap! ), and you don’t need a yogurt-maker to do it. While there are several different ways to make yogurt, this is one I love: making crockpot yoghurt (or slow cooker). Besides my Thermomix, the crockpot has got to be my second most favourite appliance in the kitchen. If you don’t have a crockpot, you can accomplish the same thing with our Squeezie Vanilla Yoghurt recipe made directly in our Zestio Reusable Food Pouches. We go through a lot of yoghurt. We enjoy it mixed with fruit, in smoothies, muesli, cooking, ice blocks and desserts to name a few. Not to forget the girls love having yoghurt in a Zestio Reusable Food Pouch, which is perfect for the lunchbox. This recipe makes yoghurt making so simple, you really should give it a go! Check out this money saving comparison chart I put together! All you do is heat up milk, let it cool a bit, stir in the yoghurt starter and milk powder, wrap it up for the night and in the morning you wake up to homemade yogurt. See? Easy peasy! 1. Add 2 litres of full cream milk into the Crock pot and warm on low for 2 hours. 3. Wisk 1 cup of plain natural yoghurt (starter culture) and 1 cup full cream milk powder with two cups of the warm milk from the crockpot. * if using pre frozen starter from your last yoghurt batch remove it from the freezer at step 1 to give it time to defrost before adding it in at this step. 4. Add the mixture to the crockpot and wisk together. 5. 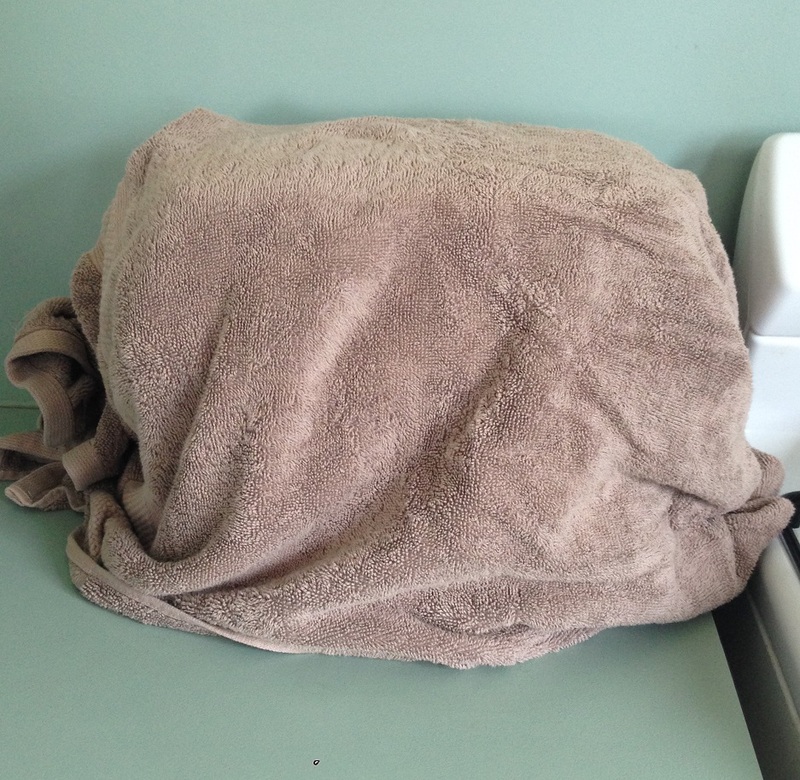 Cover the Crock pot with the lid and wrap it with a thick bath towel or blanket. Leave it to sit for 8-12 hours. 6. Once time is up you should have some delicious yoghurt ready to place in the fridge or fill your Zestio Reusable Food Pouches. * Don’t forget to reserve 1 cup of this yoghurt for your next batch! I pop it in a labelled container and store it in the freezer. Zestio Dissolvable Labels are really handy for this! An easy economical, homemade yoghurt for the whole family! Add milk to the crockpot and warm on low for 2 hours. Turn crockpot off and leave sit for 3 hours. 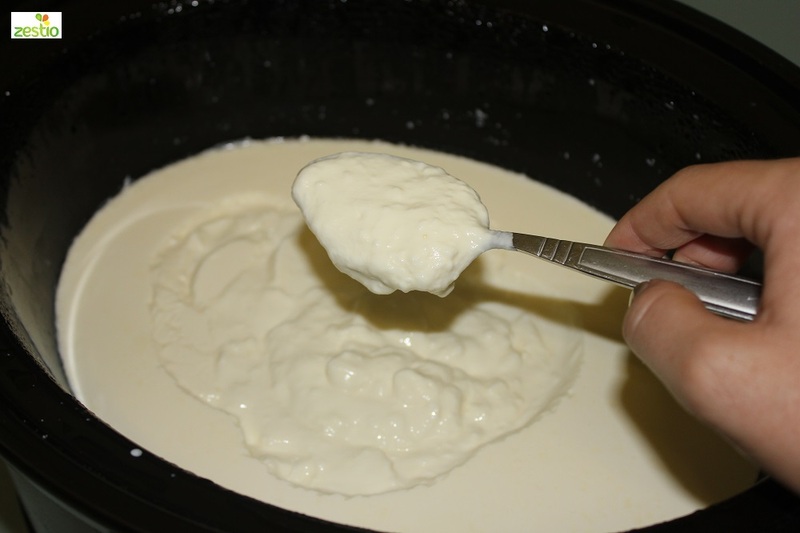 Whisk the plain yoghurt and milk powder with 2 cups of milk from the crockpot. Add mixture to the crockpot and whisk. Cover the crockpot and wrap with a thick towel or blanket. Leave it to sit untouched for 8-12 hours. Spoon into Zestio Reusable Food Pouches for a great lunch box addition or serve with fruit. I like to start warming my milk when I prep dinner. Then I can add the ingredients, wrap it up and leave it to sit overnight. Having yoghurt ready for the fridge in the morning!